Product prices and availability are accurate as of 2019-04-14 05:30:43 BST and are subject to change. Any price and availability information displayed on http://www.amazon.co.uk/ at the time of purchase will apply to the purchase of this product. This brilliant gold Single Malt Scotch Whisky from the Isle of Skye is powerful, and packed with peat-smoke aromas with a hint of sea water and a citrus sweetness. It is full-boodied, with flavours of rich dried fruit, loads of smoke and strong barley-malt flavours. 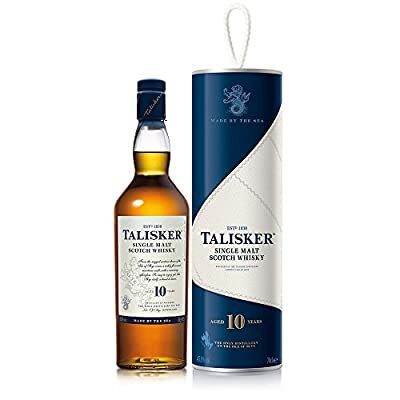 It is warming and intense, with a pepperiness at the back of the mouth and a hugely long finish.This one comes in a handsome presentation tin, making it a fantastic gift for any peated Whisky fan. This brilliant gold Single Malt Scotch Whisky from the Isle of Skye is powerful, and packed with peat-smoke aromas with a hint of sea water and a citrus sweetness. It is full-boodied, with flavours of rich dried fruit, loads of smoke and strong barley-malt flavours. It is warming and intense, with a pepperiness at the back of the mouth and a hugely long finish. This one comes in a handsome presentation tin, making it a fantastic gift for any peated Whisky fan.